Tremolo for SE Zach Myers? Discussion in 'PTC - PRS Tech Center' started by Ketil, Aug 20, 2018. 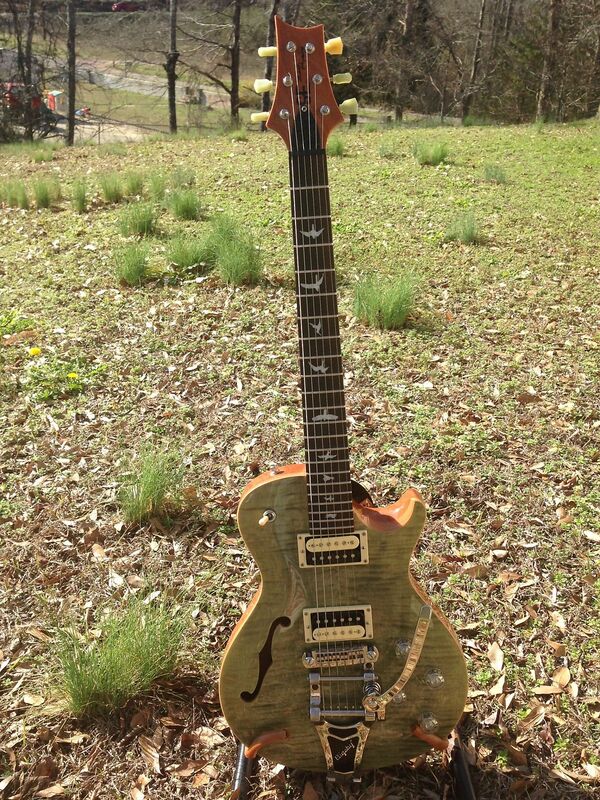 Hello, I have just ordered a PRS SE Zach Myers, which has the adjustable stoptail bridge, and I wonder if it's possible to put some kind of vibrato/tremolo unit on this guitar, and what type? Would a Bigsby work for instance, just leaving the original bridge as it is, but letting the strings pass over the bridge and straight to the Bigbsy? I found one that sold recently on reverb. They just use the strap lock screw and didn't drill the extra hole on each side. Maybe why it looks a little off. Kind of cool looking overall though. Read some more and apparently the guitar is slightly small, so the fit isn't great. You can check it out for yourself here. With that model bigsby you might have to make a shim platform to support it. I would love to know how well this does or doesn’t work. Preferably with someone else doing it besides me. bodia and Antmax like this. Truth! That looks like those pictures you get with someone that has rigged up their scooter to haul a mattress. Thanks Hm, that looks a bit weird yes.. But with better customization this might actually work, with one of the shorter Bigsby models, maybe. how embarrassing and great! please get this guy onto this messageboard. you could always try this.